Beautiful hand carved antique button pendant wire wrapped with 14k gold filled wire. 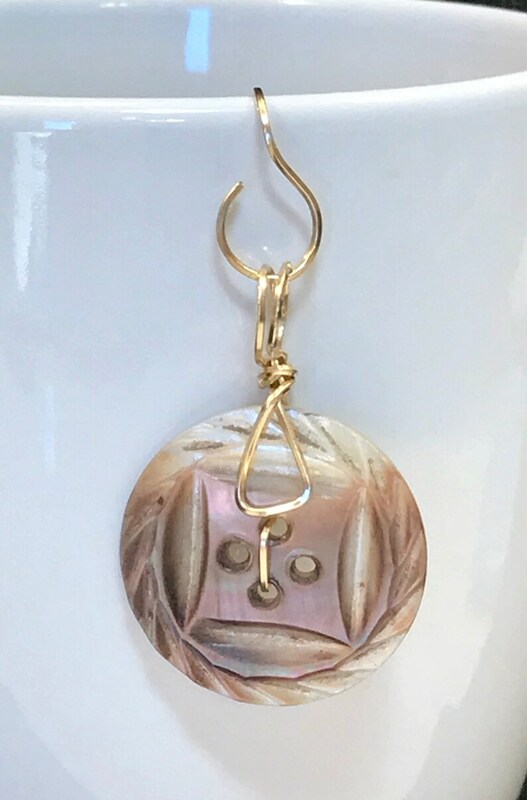 This handcrafted pendant would complement any of my 14k gold genuine gemstone chain necklaces found in my other listings. The pendant measures 1-3/4 inches tall and 1-1/8 inches wide. What does gold filled mean? Gold filled is 5% 14k gold bonded to either sterling silver or a base metal core through heat and pressure. Gold filled should not be confused with gold plated, which has a very thin layer of gold, whereas gold filled has a much thicker layer of higher quality solid gold, making it more durable, and creating a long lasting beautiful look.